Where ’16’ is the sample ID, followed by the barcode sequence, ‘L00X’ is the lane number, ‘R1’ means forward reads. There’s a lot going on here, so let’s unpack this briefly. The backquotes (` ) mean that the output of the command is presented as command-line parameters to the enclosing command. So in this case the ‘find’ command is listing all file names in the current directory at a depth of 1 (no recursion into lower directories). Next, this is pipe’d (with |) to egrep which searches the list of filenames for a regular expression that indicates a string starting with 16, followed by any number of any characters, then an ‘R1’. Since the expression matches whole strings, this will find the above files. These filenames are then passed to ‘cat’ as command line arguments. The concatenated files are then redirected with the greater than (‘>’) to the new fastq file. The ‘&’ indicates that the shell run this in the background. I hope this is useful. I spent about an hour tracking this all down, so I wouldn’t have to process dozens of samples by hand. 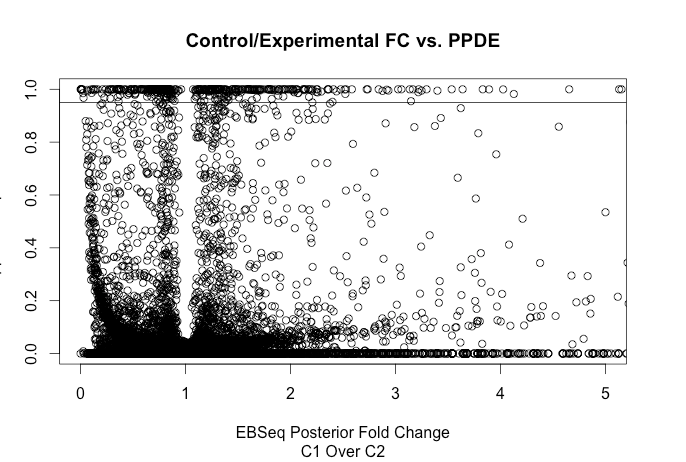 The differential expression analysis program EBSeq produces a number of data objects as part of the workflow, but there aren’t many options for visualization of the data. However, this depends on knowing ahead of time your genes of interest. It is not practical to generate a heatmap with hundreds or thousands of DE genes. 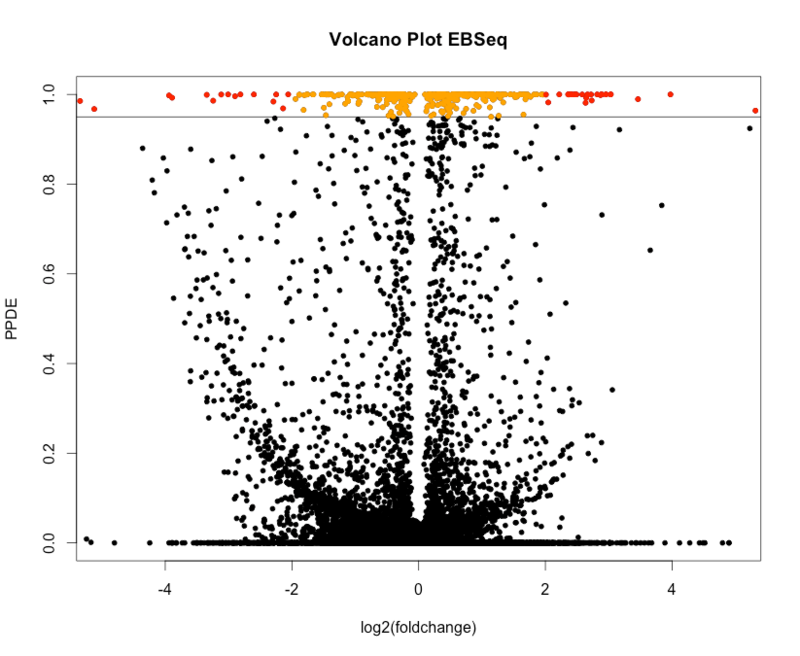 A pseudo-volcano plot for EBSeq results. The y-axis is posterior probability of differential expression (PPDE). The “abline” command places a horizontal line where the PPDE is equal to or greater than 95%. This would be equivalent to an FDR of 0.05. Fig 2. Log(2) Fold Change on the X-axis. Fig 3. The final plot, with colored points for the DE genes, and higher fold change indicated with red.